With Apple having opted for a September launch of its latest iPhone models for the last few years, the company is expected to follow that same pattern this year, and is allegedly restricting retail employee time off for that month with four months to go. Apple retail employees in Germany are said to have been restricted from taking vacation days in September, according to German-language Apple site iFun.de. Citing an anonymous source, the site said it has "little doubt" that the information is trustworthy, according to a machine translation. If true, the information isn't surprising, if it is a little early. In years past, Apple has blocked its employee vacation dates only weeks before a new product is unveiled, while this move would in fact be months ahead of time. Apple has chosen to unveil and launch its latest iPhone models in the fall since it debuted the iPhone 4S in October of 2011. Starting with the iPhone 5 in 2012, the announcement and launch were bumped up slightly to September, and Apple stuck to the same timeframe in 2013. If Apple holds the same pattern this year, it would unveil "iOS 8" at the Worldwide Developers Conference on June 2, announce and launch its next-generation "iPhone 6" in September, and new iPads would follow in October. 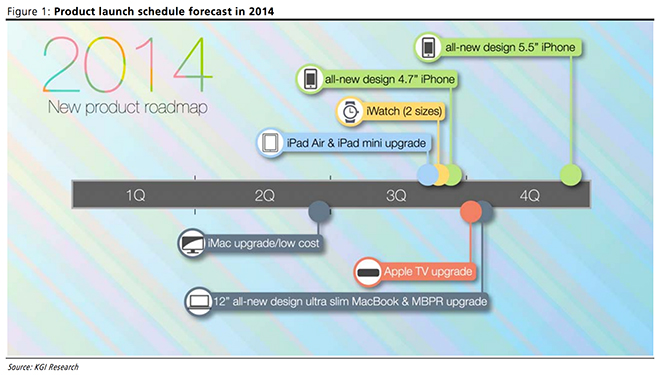 This year's new iPhones are expected to come in two different, larger screen sizes of 4.7 inches and 5.5 inches. But Apple has plenty of other rumored products on tap this year, suggesting the company is setting itself up for a busy second half of calendar 2014. In particular, the company is expected to launch a newly redesigned 12-inch MacBook Air with Retina display, a revamped Apple TV set-top box, a new version of its OS X Mac operating system, and even a rumored wrist-worn "iWatch." With so many major product launches expected, it's possible that Apple could be taking precautionary measures well in advance this year to ensure its stores are properly staffed for a busy late summer and early fall.